The Court of Cassation yesterday ordered a rights institution to reinstate a Bahraini employee who was arbitrarily fired when the administration of the establishment was changed. According to the plaintiff’s lawyer, Dr. Mohammed AbuHussain, the man worked as a part-timer at the institution for fifteen months back in the years 2013, 2014. On August 17, 2014, the Secretary General of the institution appointed the man as a full-time employee due to his excellent performance. The decision was implemented on September 1 of the same year. Dr. AbuHussain explained that his client was given the choice by the officials at the institution to “either return to his part-time job or leave the establishment”. 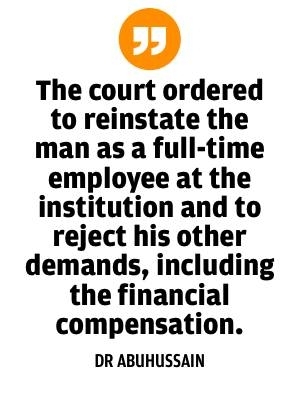 The lawyer said this happened eight months after the man was assigned his new job and shortly after the Secretary-General, who hired the man as a full-time employee, had retired. The administration also informed the Social Insurance Organisation (SIO) that the man was sacked as the head of the intuition didn’t approve his employment.